Despite Heavy rain and a drive to the end of the Dubai Palm outer frond to get to the Waldorf Astoria venue, the summit had a packed attendance. It seemed that thunder and lighting had followed the attendees into the ballroom when a sound and laser show started the event. The day started with presentations that highlighted the disruptive potential of technology, and how that can be leveraged through the scalable azure platform to brig together social listening, predictive analytics, Big data, Internet of Things, Cloud based multi platform any time anywhere Dynamics Ax Enterprise erp and CRM systems. 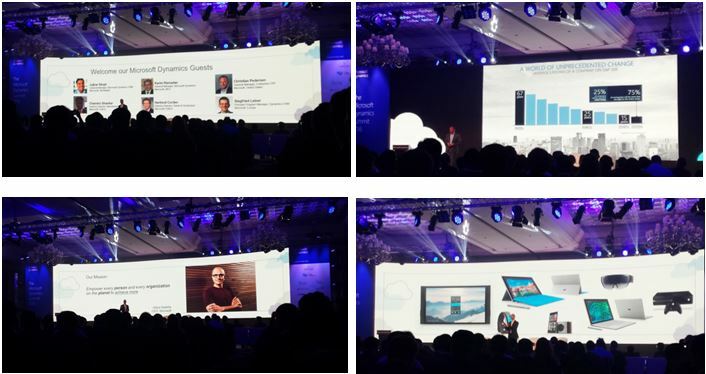 Several videos featured other Microsoft speakers including Sathya Nadell as well as case studies of local implementations. This was followed by a panel discussion and a packed day of presentations. Synergy Software Systems, a gold sponsor of the events, had a constant stream of visitors to their stand. Our rolling presentations showed Dynamics Ax and Dynamics CRM, and complementary solutions such as our incredible ACE construction BIM suite, Dox42 to enable end users to create richly formatted reports themselves in Microsoft Office rather than in their business systems for enhanced presentation without need for development cost, the BI4Dynamics pre-built report packs , and the Prophix produitised CPM solution. At the end of a busy day Synergy Software Systems Director, Stephen Jones showed that despite the emphasis on the new html 5 user interface and technical architecture there are also quite a few functional tweaks to welcome in almost every module. To illustrate the general use of workspaces and the new UI he presented an end to end run through of Employee Lifecycle management in the HR module in the new release. He then showed some screens shots of Synergy’s localised Ax GCC Payroll and HR enhancements upgraded to the new release. He rounded off the packed 30 minutes with a look at the extensive capabilities of Power BI to analyse HR and Payroll data. A Gartner survey last year , “Survey Analysis: Critical CFO Technology Needs: 2014 Gartner FEI Study,” June 23, 2014, http://bit. ly/1Ga5I50 highlighted the importance of C level Executive collaboration when selecting an erp system. A critical component of any successful technology integration project is teamwork—especially among those with decision-making power and departmental oversight. In the case of ERP, the CIO and CFO should work hand-in-hand to determine which solution is best positioned to support the business and technology requirements of teams across the enterprise. They also need to jointly provide the highest value for the technology dollar—affordable to purchase and implement, economical to operate (low total cost of ownership), and capable of facilitating long-term financial stability and growth. 1. Determine how each ERP option supports overall organizational strategy. According to the 2014 Gartner Financial Executives International CFO Technology Study, out of a survey sample of 210 executives, the CFO authorized 29 percent of IT investments. This surpassed even the CEO for decision-making in this space. CFOs are clearly interested in ERP costs in both the near and long term. The issues around how well each solution supports the company’s comprehensive goals for current and future operations are just as critical,. Analysis requires input from, and partnership with, the CIO ad other C Executives. The CIO has to worry about wider issues such as compatibility, support, upgrade path, security, connectivity, reporting features and the day to operational costs, such as a/c/ energy support contracts, IT training and so on. There is also a strategic role to play to keep abreast of, and to leverage new technology to better leverage the deployment and use of the erp functionality e.g. mobility, predictive analytics, IoT Executives should eb able to articulate clearly how each proposed solution /functionality /feature either does or does not supports strategic growth. To crystallise thoughts identify a realistic solution ROI. That will help to set a budget early and help in priosiritising requirements, and must have vs nice to have features. It also helps to understand what is a sensible level of investment to drive the system in top gear rather than in 1st gear. As CFOs take a more hands-on approach to technology decision-making, they are strategically prioritizing their options, and placing ERP software high on their list of potentially transformative tools. In the Gartner study, 47 percent cited enterprise business applications in the top three most important technology investments, with 23 percent putting them at the very top of the list. Forty-two percent of CFOs cited these applications as their most important technology investment over the next three years. Similar results are seen in surveys of CPM software, and the bottom line results also show that leaders in bottom line performance measures are those with the right systems. CIOs and CFOs should both be looking for the same thing—ERP software that delivers the highest possible return on investment (ROI) with minimum risk, maximum agility, and scaleablity. A system that not only helps to compete today but that can adapt and grow with the business. Determining the required ROI for the business as well as the likely ROI of competing solutions goes a long way toward clarifying the value of available options. Similarly, a budget helps to narrow the software choices to those most likely to drive and sustain long-term growth and profitability or to ensure that additional investment in more features enhance rather than undermines the strategy. Budgets are not tablets of stone -they are acceptable benchamarks- that does not mean they cannot be changed if you have good reason. The key is to how will you decide and ROI is a good test. 3. Consider a solution with built-in Business Intelligence (BI) capability: When executives in the Gartner study were asked to identify the business priority they believed most required technology support, 62 percent indicated “facilitating analysis and decision making.” To this end, executives are increasingly looking to BI tools to capture insights across the enterprise, and realizing that ERP solutions such as Microsoft Dynamics AX provide this critical capability as a built-in feature. For both the CIO and CFO then, it will be paramount both to understand which software options include this functionality (and how deep that functionality goes) and to require vertically-focused expertise from potential vendor partners to determine which tool best supports the organization’s use case. 4. Schedule your ERP rollout to maximize the functionality that will provide the foundation to grow and to control costs: Given the potential disruption as major systems are implemented and adopted, CIOs and CFOs should bring together relevant information from their respective areas of expertise and influence to carefully plan a timeline for project planning, implementation, and support that protects against financial risks, system downtime, and process changeover lag. Gartner suggests a “pace-layered strategy” to minimize these types of integration risks, reduce costs, and maximize security. Under such an approach, companies can categorize each business application (including ERP) as a system of record, differentiation, or innovation, then apply differentiated management processes for each, driving more thoughtful, collaborative, and high-value integrations. It comes as no surprise that a successful ERP deployment hinges on partnership—and that synergy among department leaders is essential to securing the executive approval, team unity, and partner relationships required to implement a successful and even transformative long-term software solution. By working together to identify common goals and arbitrate diverging viewpoints, CIOs and CFOs can ensure the final selected system is one that not only meets their individual needs, but is also optimally positioned to meet business requirements and operational objectives enterprise-wide, securing sustainable growth and profitability. We look forward to meeting all registrants tomorrow at Microsoft Gulf. The seminar is fully booked. If you are unable to attend or were too late to register then please contact us. • Serialization allows for more accurate ingredient traceability throughout the supply chain. • End-to-end audit trail by serial number helps manufacturers to recall more efficiently and effectively. - Patents Expiring losing major revenue streams, seeking cost savings. - Generic Drugs Patents expiry more generic products – , reduces the profit margins for all manufacturers. Pharmaceutical companies search for SCM cost savings to maintain profit margins. Airlines only make money when flying. Service providers must offer exceptional service levels. When outsourcing, the main concern of air carriers is not how much it costs, but how the service provider will do what needs to be done. Risk is compounded by the reduction in the number of suppliers from hundreds to dozens. The same is true of logistics providers: aerospace providers want to work with only one or two that understand the industry’s specialized needs and have the WMS systems to handle the scope and the SLA’s. Aerospace supply chain managers must meet increasingly tight delivery time windows. Aerospace companies are frequently requesting that 3PLs manage vendor relationships and inbound logistics. SWAT—Space Warehousing Accelerated Transformation. To reduce inventory – without raising risk airlines may collaborate to centralise spares to reduce inventory while maintaining service levels. Airline parts are high-value and have a limited lifecycle. Each is monitored and replaced on a specific schedule. Governments impose strict rules about tracing the location and history of airline parts, down to the serial number. Reverse logistics is a part of the job —not only moving the parts, but monitoring those through repair, and return for service, and providing visibility to the carriers. Tracking expectations are increasingly sophisticated and granular, with more data collection points and greater detail. Air carriers want to search databases by reference, project, or purchase order number. Parts are more specialized, with less ability to share these across airlines, thus complicating inventory management. RFID and GPS are emerging to increase visibility and tracking of aircraft components. Modern WMs systems are essential. Although the term mrp was coined by Joe Orlicky back in the 1940s and ERP came along in the late 80s there are still many organizations that don’t truly understand the value of ERP. While streamlining and automating your financial processes is a huge benefit, that is only one piece to a much larger puzzle. Successful ERP solutions enable businesses to capture, manage and translate data into business insight from a wide range of activities. An erp system is not just a typewriter- it makes the right data available in the right context for informed contextual decision making at all levels of the operation. Erp can help create new levels of efficiency and reduce manual tasks through streamlining, and directed process automation, a and exception reporting and dashboards.. It can reduce errors with profiles, policies and templates, and provide more control with workflow processes, and analysis tools. ERP provides a platform to re-engineer your business processes to fit with best practices, and adapt to changing technology and market demands and opportunities. Understand your real across and how you make profits-which customers and products. What if different scenarios. Ultimately, ERP is a platform on which to design a better business. Organizations who don’t share this vision for ERP will struggle to reach a solid ROI. ERP used to be reserved for large organizations, who could afford to take on such an expensive transformation. However, thanks to advances both in technology and infrastructure, and changes in licensing modules, and the emergence of cloud technology ERP solutions are accessible and affordable to businesses of any size through the cloud. Organizations no longer have to invest half their earnings into hardware and IT staff, and can get up and running much quicker than ever before. ERP is not about fitting your existing practices to a technology system. While that may apply in some aspects, the goal is really to improve your processes with a system that can enhance their accuracy, automate them, and integrate with your partners and suppliers. While a budget usually can put a cap on ERP projects, don’t settle for less than what’s possible. There are many ways to utilize ERP when you understand what others have done and what is possible. Don’t buy a Ferrari and drive it in first gear and skimp on servicing and driver training. Don’t spend money on endless reports and customisations to suit every employee’s whim. Be prepared withy our report design, business processes and data – use self elearning resources, get involved early so you can do your own testing, and use consultants for where they can most add value without wasting their time. ◾Training, available resources, and user willingness to adopt. ◾Test! Test every aspect of the system with each of your users as much as possible before going live. Find out why every Synergy project goes live on time to budget- in 23+ years no Synergy project has ever failed to go live and none has ever needed reimplementation. Ask our customers. Find out why we were awarded highest customer satisfaction by Microsoft. Is there more to choosing an erp system than keeping the CFO happy?? Mobility. In our personal lives we are more mobile and connected. Sales of tablets, netbooks, mobiles etc continue to exceed projections as does the use and prolfieration of social media. We expect the same tools at work. Organizations large and small are becoming ever more mobile, to drive down costs,and improve service. Mobile alerts, mobile reports, and mobile BI are now expected. By 2013, 1.2 billion workers will be mobile—that’s 1/3 of the overall workforce. By 2014, 50% of devices used to access business solutions are expected to be smartphones. Will the solution you’re considering accommodate mobile workers? IT Costs. Some people claim 84% of organizations have a remote workforce – Typically true of the sales team, installation and service engieers, meter readers, delivery men, consultants trainers, etc. But on average 85% of datacenter capacity is idle, and 70% of IT budgets are spent maintaining datacenter operations. What are inefficiencies like these costing your company? It’s not just the software it’s the server room rental, the energy, the A/c , the hardware depreciation and obsolesence, inusrance, cleaning etc. 3. Access. Think about how people can interact with their solutions. Employees struggle when they can’t collaborate with people who don’t have full access to important data. Can people outside the solution or organization be given web and mobile access to specific reports, charts, graphs, and KPIs? Is the data real-time? Marketing these days is frequently a self service activity, as in many case are business processes like booking on-line or checking in for a flight via kiosk with a bar code on your mobile for a boarding pass, or searching a knowledgebase for help. Project teams are geographically remote but need to uodate each other and to share plans. 4. Simplicity. Workers at home use laptops, phones, tablets—all their preferred devices—with a common experience, to make those all easier to use. What do your staff really need? Compliance and collaboration tools – why have expensive offices, why waste staff time on travel, mobility, internet presentation tools, collaboration portal workspaces, and cross supply chain collaboration are all factors but you also have to think about security and compliance – what support do you have for these? Can you easily handle new reporting requirements? Can you easily handle new subsidiaries and acquisitions – language, currency, vertical requirements, localised statutory compliance? Does it matter? Watch your competitors and see what they are doing but don’t wait too long! Year end is a good time to rethink your strategies and your systems. if there are aspects of your business or systems that are not delivering or you are not sure what is possible then why not undertake a mini business review and let us help you understand how technology can help you to cut cost or add value or reduce risk and to evaluate whether there is a business case. Infor’s branding overhaul – visit www.infor.com and results in a much cleaner design. The new look will shortly be incorporated across SunSystems and all of the Infor solutions. It is also good to see a return to the simpler ‘Infor SunSystems’ naming convention. Windows 8 and SQL Server 2012 certified. WorkSpace – Delivers a unified user experience that supports single sign-on, common navigation. The user interface combines deep industry processes, analytics, and collaboration that helps you make better and faster decisions. SocialSpace – A social business platform that: shares objectives, captures the conversation and keeps data in context. The Activity Feed connects: staff, applications, machines and data in real-time so they work better together. There is an in context application called ‘Paparazzi’ which allows users to ‘follow’ crucial business processes. Mobile innovation – You can access key features in an intuitive tablet/mobile experience. Simply provide your web connection details to connect to your organisation’s SunSystems server. Alerts, notifications and exceptions - Set up notifications for the events that are of relevance to you, for example the creation of projects, customers and orders received over a certain amount. These are then delivered to you via email or within the Activity Feed, allowing you to proactively monitor your system. Why does Infor Susnstems have such dedicated users? Product’s users delight their ability to easily get the information they need when they need it, and to adapt to changes without really changing the system (time and again). Two key enabling design features are the Unified Ledger and Smart Transactions. The, Unified Ledger enables there is an immediate availability for combined (unified) reporting across AP, AR, and GL. Smart Transactions refers to the ability of SunSystems to adapt the transactional data captured to meet business and reporting needs. This is a feature built into the fundamental architecture of the ledger, and it does not rely on any other external technology. The SunSystems ledger has a sophisticated coding approach that does not rely on traditional segmented account codes with a fixed structure. Instead, it uses simple chart of accounts (COA) plus a range of user definable analysis dimensions that have independent coding structures—much like an OLAP cube. The result is a flexible coding structure that can be configured to meet the needs of every business unit, and even refined to capture different additional data, depending on the account or the type of transaction. Configure the ledger to define the dimensions of data you want, and also easily adapt (modify) the account’s structure as business needs change. The system does not rely on generating all the permutations of account and segments (which can result in a massive combinatorial explosion). New dimensions can be added as required to adapt evolving data needs. The dimensional structure of the ledger is well suited to analysis, and this is exploited to the full extent by the advanced Query & Analysis tool. This simple tool provides a reporting environment for end users and accountants to design their own reports with no dependence on information technology (IT) . Data is aggregated on an as-required basis, without being bound by predetermined rollup and balances, enabling Smart Transactions to deliver the results from any desired perspective. SunSystems holds the Smart Transactions dimnesionally which is ideal for a slice-and-dice reporting tool such as Query & Analysis. The reporting tool understands the metadata describing the Smart Transaction structure. Sunsysems Query @ Analysis tool aplty knwon as “Vision”, understands the transactions and provides a simple interface for users to inquire without knowledge of the underlying database, tables and views to get OLAP-style analytics from the source ledger system. The Unified Ledger is similar to Smart Transactions—it is fundamental to the application design and architecture, and does not rely on any special additional technology. The Infor technology platform now oes much furher with the underpinning ION technology which is transforming concepts of both “what?” and “how?” enterprise systems should deliver. Transport and fleet management – GPS tracking – home delivery for U.A.E. Where does erp start and stop. Usually ts aorudn inventory – when it arrives and youreconginse finaicla liability and when it leaves and you pass title on shipment to the client. So how do you know where the inventory is en route or, hwo do you know when a vehicle will be available to deliver to a particuler client, how long each delivery took, or when do you fiind it out whether each delivery was successful, whehter a POD was signed?, How do you know where a vehicle is right now if you need to reroute it ? How do you track the temperature of cold store goods during delivery? How do you keep track of incremental costs as trucks cross borders?. If you have a large distribution fleet e.g petrol distribution, or a large retail chain, or you manage home deliveries – ecommerce, parcel delivery etc. then you will be well aware of the need for systems to extend traditional erp. Dubai has beena major distribution hub throughout most of its existence. New ports and airports across the region, and ralways planned to link those with logistic and material cities will see the whole region increase its importance as a logistics hub not only for this region but between North and South and East and West. Africa is growing rapidlythere is expansion and rebuilding in many areas of the region and China and Europe will use this region as the point of entry. Internet shopping and ecommerce and lean processes are challenging traditonal distribution models, while high oil prices, energyy conservation and carbon emission control all call for better solutions. Huge advances in GPS, mobility and dot net technology has provided us with the necessary tools to provide cost effective solutions specific to your business. Ask us about how WebXpress can extend your exisiting systems to signifcantly enhance your supply chain management – just as it has done for many other logistic operations. So, for many readers it may be a surprise to learn that Synergy has been implementing mobility and RFID solutions since the early 1990′s. This includes Access control, and T@A systems as well as large scale Asset tracking solutions, loyalty cards, etc. For exampe we have implemented solutiions for s shopping mall, an IT department, Hotel groups, a University etc. RFID technology is making major advances, year on year, and delivering bottom line results in many new ways. We have been seeing more companies benefiting from embedding RFID into their products. We are excited about the new capabilities that are emerging and innovative applications that are enabled when Monza and Indy chips are embedded. The next version of the UHF Gen2 protocol includes loss identification/prevention, item anti-counterfeiting, security and machine-to-machine interfacing. A recent annoucment is the availability of the world’s first RFID reader network application for the Apple iPhone. One of our partners has just announced an advanced fuel distribution RFID system, in addition to their established solutions like Jewellery tagging etc. Synergy also provdes asset tags, and tagging services and mobile data collection services e.g for annual count. Our solutions work with integrated modules for Fixed Financial management and Planned maintenance, Capital project accounting etc. Expect to see more innovative applications as the technology advances and mass production of tags reduces costs. Infor recently acquired Lawson, Epicor and Activant were acquired as part of a private equity buyout, and JD Edwards and PeopleSoft were both acquired by Oracle several years ago. Some of the leading ERP vendors, including Oracle, Infor, and SAP, have been extremely aggressive in acquiring other ERP software solutions, as well as best of breed points solutions, to augment their core solution offerings. With each of these acquisitions comes uncertainty – will the new parent company continue providing maintenance and support? Will it invest in future enhancements? Or will it force a costly and risky migration to another product? Similarly a CEO, CFO, or CIO concerned with business risk shoul validate the viability of their local implementation partner. Do they have on the ground presence with adequate depth and breadth of skills. Is there evidence that they invest in the necessary infrastructure and staff training? Whan was the comapny first registered? Visit their office - does the size seem adequate for the supposed staff size? od they have adequate training facilities? Do they use a formal helpdesk system? Do the consultants have a National id card and Labour card? When did they first become a certifed partner for the software? Do they have certified Consultants, Trainers, and Project Managers? Do they struggle to offer reference sites? is there evidence that a customer has used their services for many years? Can they provide bank references ? Do they have supporting networking and DBA, and interfacing skils? Does the managment team seem to understand the product and your vertical? What is their length of service and credibility? Do they have international alliance for international project support? Have they ever undertaken successful projects of this size, and duration?. Do they have the scaleability to take this on? Support staff, Project managers, Lead consultants, Qa staff, Test systems etc. Such simple questions are prudent to consider – these may not guarantee the very best partner but they will help ensure they are competent and that you avoid the worst! Look good, save money and make everyone’s life easier. Really! Systems cannot ‘go live’ without external facing documents: Purchase orders, Quotes, invoices, cheques, delivery notes etc. ‘Out of the box’ reports are seldom adequate without customisation. It takes time. Time to explain, to develop, to deploy to a test system, to create test data and transactions, to test layout content and printing, to test distribution and archiving, to rework, to move to live systems, to create variations by site, and by trading partner and to get approval from marketing and management is a major area of underbudgeted implementation time and cost. So why not do this outside the systems in tools like Microsoft Word using your own staff, who know how to use that software and how they want the finished report to look? Yes it can be done! Use the same solution instance for all of your companies for almost any software, from anywhere in the world you have connectivity ..
FormPipe Input/Output Management ensures that the document goes in the right format from operational systems to business systems, from web to business systems and from business systems to the web. Improve your branding with modern fonts, colours and consistent look and feel – don’t be constrained by canned report formats. FormPipe Input/Output Management manages the organizations many different types of business documents, Print templates, forms, letters, invoices, orders, reports whether an electronic format such as XML, XHTML, EDI, PDF / or in paper format. With FormPipe Input/Output Management your organization will be compliant with all requirements of a document’s appearance and data format, regardless of original system format. Manage information flows in and out of all your business systems, and use with any operating system regardless of what those systems do or what data they produce. Produce consistent house style and branding across all you application documents . Tailor external documents by trading partner – add their logos, or use a different sort order, or add a page total , or a bar code etc. Format and sort and group outside your erp system using familiar office program template documents. Produce as a pdf a fax or an email or send an sms at the same time while you also save a copy in the associated document management system. When you upgrade your business systems your reports do not need to be redesigned - remap the print output to the same report templates and save days of reprogramming and testing. Style sheet support - much easier to change the look and feel of the mobile application, inside AX! One of the great advantages of Dynamics Anywhere is the fact that in runs online on almost any device with a browser, including the iPad. We will offer an offline app for iPad Field Sales. Do you have a lot of documents? Construction project contracts and drawings? Lawyers office case files and testimonies, Health records, Insurance claims, Utilities customer records…. How do you find all the right documents quickly? What about version control? and how do you know who accessed, modifed or printed what and when? Most business processes depend on information – this often means multiple files and documents and various stages of approval or information gathering and dissemination. The abiity to rapidly configure eforms and workflows and to store documents with context sensitive search features provides both rapid implementation and major cost reductions. There are issues of compliance, of data sensitivity, data loss, and timeliness of action, when orignal documents are routed physically. ASTRA ZENECA uses PLATINA to manage their digital log books for their production entity in Södertälje. In this case the system is validated according to FDA. Tele2 manage their telecommunication towers all over Europe with use of PLATINA Software. This includes documents and work orders along with distribution of digital information to stakeholders outside the Tele2 system. PolyPeptide AB recently acquired the system for divergence management, and the managing of quality documents along with “SOPar” and CAPA processes. Eventually this will also contain IT tasks, drawings, and agreements. Trelleborg AB uses PLATINA for their quality management which primarily involves divergence and quality documentation. 13 county councils in Sweden use PLATINA for their quality documentation, divergence and diary management. PLATINA is n integrated, versatile .NET platform for self-development and expansion of information- and operational systems. PLATINA makes it possible to rearrange the different processes of how documents, agreements, cases and other tasks flow through the organization – using logical conditions and alternative approaches throughout the process. The system includes features and applications for: version control, management review control, indexing, and publication, distribution –and safety control. Indexing of documents including metadata enables powerful and efficient search functions. The publication and distribution feature is used for access and authorization of documents, while the safety-controls permit the right users the access of documents. .
PLATINA Document Management includes applications for a controlled “check in/check out” of documents. The ‘lock’ function ensures that only one user at a time is able to make changes in a document. The document can easily be sorted into categories and folders. Moreover, the users can mark documents with additional metadata i.e. information describing the document. A new interface via DeSL’s web portal to enhance end user’s experience and to support functions such as ‘my home page’ and Excel grids. Capabilities to import data directly from PDF’s and spreadsheets to create on-line tech packs and product libraries without the need for re-keying. Supplier/Vendor compliance management including standards such as CPSIA. AQL quality standards within production/procurement. Integration between Story Boards, customer sales catalogues and E-Commerce. Logistics management and direct deliveries for purchase orders. Integration between Line Planning and Sales and Demand Forecasting. Colin Marks, CEO DeSL, states “this version represents a new vision and paradigm for PLM and ‘end to end’ fashion software. We’ve not taken the easy route of incorporating 3rd party products such as Excel grid controls into our solution. We developed our own because purchased 3rd party products are generally too slow over low Internet connection speeds such as those experienced in remote locations such as China, Indonesia, Cambodia and South America etc. Most of our customers want to include their suppliers/vendors in their collaborative network so speed of response is essential. We have also taken huge steps with the full integration to Adobe Illustrator. Creative people don’t really want to use commercial solutions such as PLM, so with our new ‘plug in’ they don’t need to! We enable designers to create products, tech packs, BOM’s and sample requests, all from their Illustrator workspace. The single source of PLM data is actually extended into Illustrator with obvious speed to market advantages. DeSL were appointed Microsoft Gold Certified Partner for the 4th consecutive year. despite the much tougherMicrosoft qualifying criteria, the only vendor in this sector with this track record. With the move to version 4.0 of the .Net Framework DeSL is the only vendor with a ‘pure Internet architecture’ and accredited as .Net Connected. The full range of products are being adopted by many global retailers in addition to wholesale/manufacturing companies, with numerous new deals recently signed including Bravissimo in UK, Men’s Wearhouse in USA and GRI Retail in Hong Kong. In the fast moving world of fashion with constantly updated ranges, and styles and multiple sizes and colourways, a specialist integrated, end to end solution, from design to delivery is needed to accelerate the design and approval cycle, and to manage the complex coordination of muliple purhcase orders, and manufacturing orders and sub contractors through every stage. Combine this with Dynamics Ax 2012 and itsadvanced retail module and this is an awesome solution that will transform your business if you are involved in the apparel industry.